It was hard to leave the comfort and good cheer of the Plough at Cadsden, but the sound of rooks cawing among the blossoming treetops fetched us out at last along the Ridgeway into a cool, cloudy Buckinghamshire afternoon. Large edible snails were crawling on the grassy slopes of Grangelands hill, where half a dozen hungry red kites wheeled overhead. What a fantastic success story the re-introduction of red kites to the Chiltern Hills has been! Twenty years ago there were none of the big fork-tailed birds here; today there are so many pairs – 300 at least – that they can’t even be counted accurately. Rounding the corner of Whorley Wood we came suddenly on the sublime prospect of the shallow valley where Chequers sits, the handsome red brick Elizabethan manor house making a centrepiece for some very subtle landscaping. It seems extraordinary, and admirably English, to be able to stroll across the driveway of the Prime Minister’s country retreat without so much as a by-your-leave – though the CCTV cameras tell you that any private enterprise in the shape of a detour would likely be discouraged with extreme prejudice. 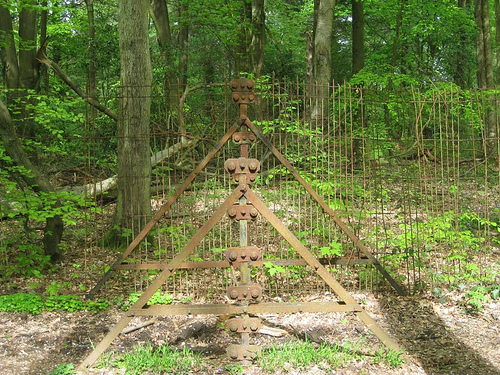 Up through Goodmerhill Wood we went, following the Ridgeway to the tall Boer War monument at the prow of Coombe Hill. A pause here for a glug of water and a stare over what must be a hundred-mile view, away over fields, woods and hill ranges, as far as Salisbury Plain and the Malvern Hills on a good clear day. Then we quit the Ridgeway for a woodland track along the edges of Low Scrubs, where twisted beech and hornbeam made a dark and mysterious Grimm’s fairytale of the old coppice wood. Peewits were tumbling over the beanfields around Dirtywood Farm, and a pair of crows swooped on a red kite like fighter boys from Biggin Hill. Bandits at Angels Five! We dropped steeply down through Ninn Wood, brilliant in late afternoon sunshine, until the Plough Inn hove up ahead, a cosy port in a green sea of leaves. 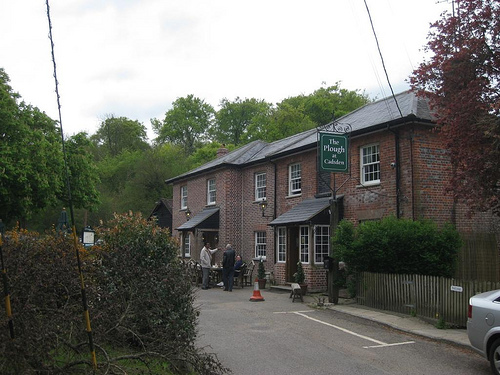 Start & finish: Plough Inn, Lower Cadsden, Princes Risborough HP27 0NB (OS ref SP 826045). 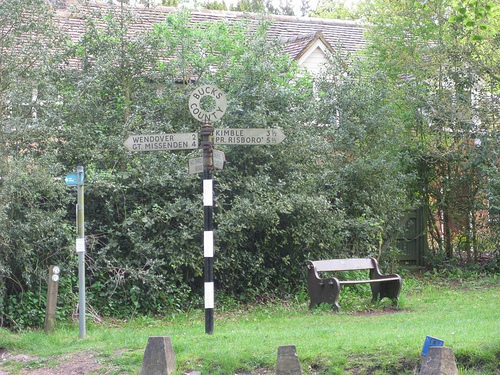 Walk (7½ miles, moderate, OS Explorer 181): From Plough, left along road; in 10 yards, right, and follow Ridgeway path (fingerposts, white acorns) for 3¼ miles to pass Coombe Hill monument (849067). In 300 yards, through kissing gate; right off Ridgeway up sunken lane (‘Bridleway’) for 150 yards to wide crossing track. Left for 100 yards; right (853067) along wide track. In 200 yards, left on woodland track (yellow arrows/YAs on trees). Follow path with fence on left for 1 mile past Upper Bacombe to road at Dunsmore (862052). 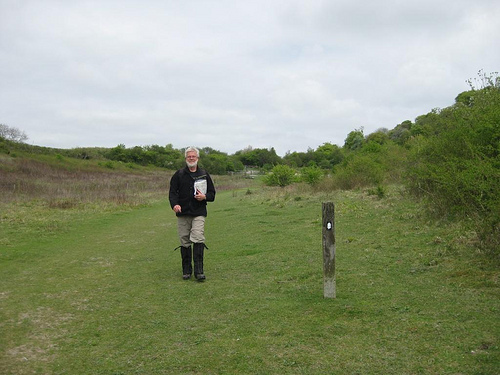 Right past pond; in 50 yards, left over stile; take left-hand path (fingerpost) to cross 4 successive stiles in fences. Keep above Dunsmore Old Farm. At foot of slope, left along track. 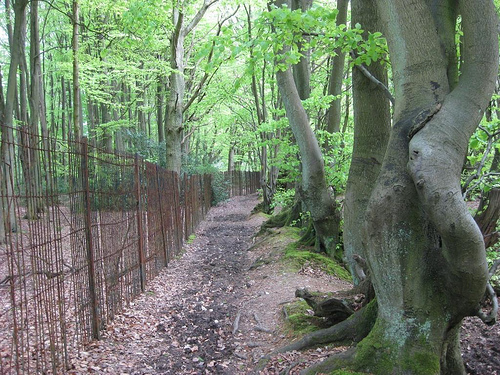 At end of fence, right (860048; blue arrow/BA) uphill through wood to Little Hampden Common (857040). Right along road past cottages; up track (‘South Bucks Way’); in 150 yards, left (‘Riders Route’, BA)’ in 20 yards, left (YA) on footpath out of trees. Forward (YAs) along 2 field edges and into wood. Follow wood edge; in 200 yards, just past deep hollow on left, fork left (851039; yellow arrow on tree) to edge of wood. Skirt Dirtywood Farm (signs, arrows) to cross road (845037). On up lane (fingerpost) for 300 yards; on left bend, forward through gateway (842037; YA) along field edges, past Cross Coppice and on into Ninn Wood (YAs). Cross trackway (833041), over stile (YA), on to descend to T-junction of paths. Right (YA); descend and bear left (YA); in 100 yards, at meeting of 4 tracks, right (YA) to pub. There must be some lovely walks in the Chilterns. But allowing for the height of Coombe Hill, the curvature of the Earth would only allow you to see for just under 35 miles at most in any one direction by my calculations. Not 100. 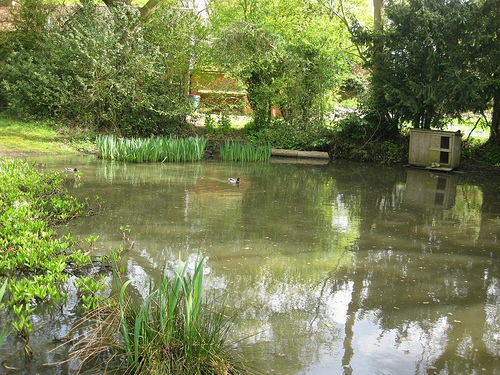 Hi, we enjoyed the Cadsden walk today (and the Berkhamsted Common yesterday) and no gizmos needed!! 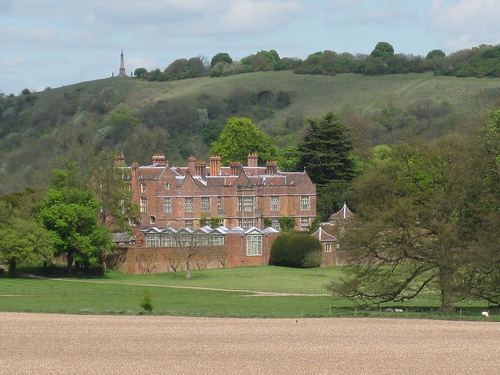 Many thanks for such enjoyable and new walks in the fabulous Chilterns (and further afield of course).